A team ofastronomers has caught on video a fiery meteor as it fell toward Earth. 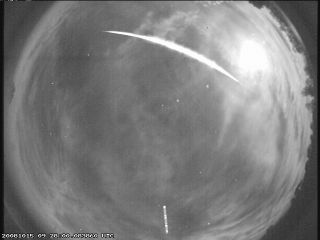 The meteorwas spotted by the University of Western Ontario's network of all-sky cameras in southern Ontario that scan the sky for meteors. On Wednesday, Oct. 15 at 5:28 a.m. EDT (0928 GMT) seven of thecameras recorded a bright, slow fireball in the predawn sky. Theastronomers of the University of Western Ontario Meteor Group suspect the fireball broke apart and dropped meteorites in aregion north of Guelph, Ontario, Canada, that may total as much as a few hundred grams in mass. Meteors are fallen debris from a comet or other space rock.As the debris enters the atmosphere, it heats up and produces the brilliantstreaks of light we sometimes call shooting stars. Though most meteors aredestroyed during this process, some make it to the ground and are known asmeteorites. "Thisevent was a relatively slow fireball that made it far into the Earth'satmosphere," said Phil McCausland, a postdoctoral researcher in planetary scienceat Western. "Most meteoroids burn up by the time they hit an altitude of60 or 70 kilometers (37 to 44 miles) from the ground." He added, "Thisone was tracked by our all-sky camera network to have penetrated to an altitudeof about 37 kilometers (23 miles) and it slowed down considerably, so there isa possibility that at least one and possibly several small meteorites made itto the ground." By knowingthe trajectory from the camera observations, the researchers can also trackbackwards to get the orbit of the object before it hit the Earth. "Themeteorite was on a typical Earth-crossing asteroid-type orbit, so we alsoexpect that it is a stony-type meteorite," McCausland said. In March,the network of all-sky cameras captured video of a meteor falling to Earth thatmay have crashed in the Parry Sound area of Ontario.